Calling all Bill Fitzmaurice fans! There is a table tuba that someone is offering me that has an unusual modification. 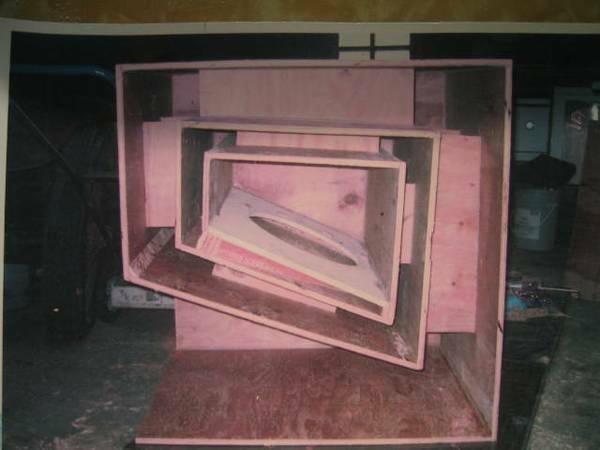 The builder set an extra inch of room for the woofer driver than what was written in the plans and, as a result, the horn has an extra 6 inches of length I believe. I'm wondering how this will affect the frequencies and if it renders the subwoofer useless. The builder claims that he cannot tell any difference--but wanted me to know for the sake of transparency and specifically pointed me to you all. We are guys, we can fix anything. The only people that are concerned about an inch or two are women. Even when that inch turns into 14 feet by the end of the subwoofer! For men and women, 14 feet is a lot! I noticed that, was not going to say anything about it. Can you explain in more detail what you are talking about ? The extra inch of space for the driver depends on where that inch is located. An extra 14 feet on the horn would make this thing huge. He apparently originally wanted to put a 12" woofer in the sub, so he had left an extra inch of headroom in the center. Now, as a result, that extra inch had to transfer all the way down. Okay, so a pretty MAJOR clarification--it only adds 6 inches. Wow. A 12" driver is not in the plans for a reason. Should have used a recommended driver or built the THT. Looks like its missing some braces too but that's a easy fix. Unless the price is very good I would build one yourself or get Jason Str to build you one. The plans seem well thought out and I would have reservations about one that deviates that far from them. There is a plywood reducer ring for a 10" driver. It's a Dayton driver, as Fitzmaurice suggested. The price is very reasonable, indeed. I would love to have Jason build me one--his are absolutely beautiful! That would be ideal, really. However, they are out of my price range at the moment and this is a very inexpensive alternative. I just don't want to compromise quality too, too much. I'm a little over budget on making the Scalas work the way I want em' to. I'm trying to cut corners where I can. If a reducer plate was added you should be OK. I almost hate to ask this, but why ask us? Why not ask Bill Fitz? 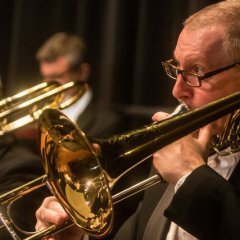 He posts on AVS.com frequently and his is very active in answering questions of all kinds, I bet he knows exactly how that slight mod would affect his Tuba design. Hey all--I had posted on the Fitzmaurice forum, without too many responses. Most people said just give it a try. I drove to Wisconsin yesterday and met a very nice guy who likes these kinds of projects. He had a BEAUTIFUL set of Belle Klipsch in teak, Khorns, Scalas, and 3 pairs of Heresys all being driven at the same time from different parts of the room. I listened to his THT and Tuba Table and they sounded spectacular. The modification makes very little difference to my untrained ear, so I purchased it at a healthy discount. The Tuba Table is now home! It's in need of veneering, which will be my next "to do" project. I'll have to work on the placement, too (as you can see). 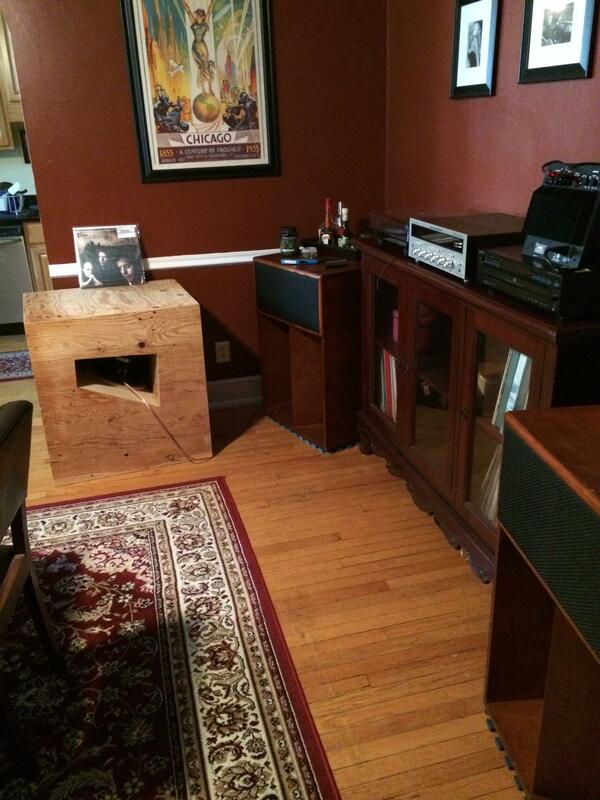 I picked up the sub, driver, and a 240W Dayton amp (all boxes and manuals included) for $100! He just wanted to make room for building other projects. why can't I find this stuff around here... Good job and enjoy!